Teeth-Chattering Chill Zone is the seventh level of World 4 in Yoshi's Island DS. This level features many slippery ice platforms combined with Bumpties and Bouncies. In addition to this, the level contains a rare skiing section. 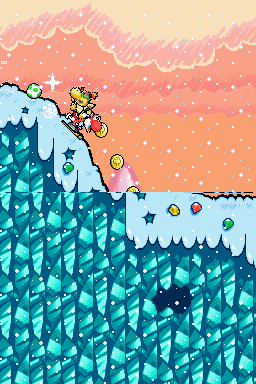 The first part of the level takes place in a section with very small and slippery ice platforms, making it easy for Yoshi to fall off a cliff. In this section, Yoshi must navigate these platforms while avoiding enemies such as an Egg-enut. There are also two sections in which Yoshi must bounce off a Bouncie to avoid being crushed by rocks. In the next part, there are some Gobblins, Fat Guys and Bumpties. After that comes a part where Yoshi must jump between multiple platforms while avoiding Bumpties and Bouncies that fall from the sky. The last part is a skiing section where Yoshi must jump over rocks and gaps to avoid losing a life. The goal roulette can then be accessed.